Our pastor recently challenged our church to pray over one particular word for 2014 that we believed God would have us focus on. (And for those who took several weeks to decide on a word, the word "procrastinate" was suggested. 😉 ) I had a 'word' for 2013, that I just decided would be a good one. Eh. Not so much. I was fully on board with this idea though, for one big reason. We also had to find a Bible verse to go along with our one word. YES! So, after much prayer and soul searching – truly – I decided on the one word I really needed to focus on. I started with the one area of my life that I feel is really out of (my) control right now. My anxiety. Working from that, I knew my word. CALM. This. This is what I need. Calm in my life and in my soul. And because I'm a visual person, I knew I needed to post this verse in my house where I can see it on a daily basis. I searched, but couldn't find a printable version of it that spoke to me. So I made my own. And because I know I'm not the only one who struggles with out of control anxiety (I am truly sorry, readers. 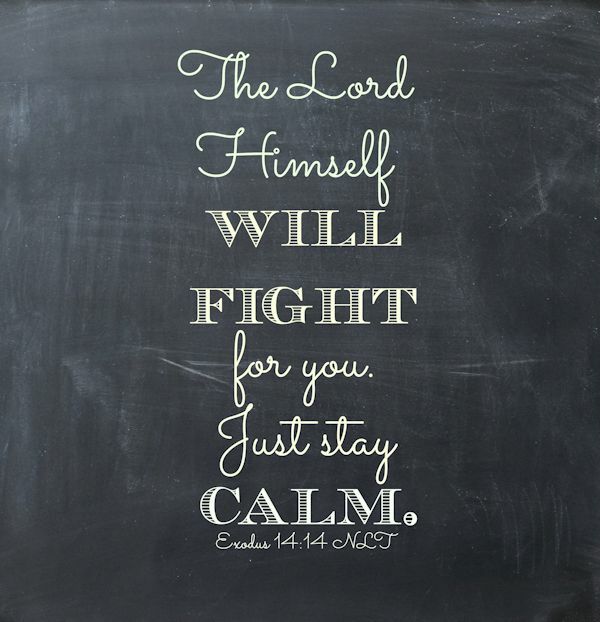 Believe me when I say I empathize…) I'm sharing a free printable version of Exodus 14:14 with you! Just click the link below to get the full sized version. It prints great as a 8×10. Please feel free to Pin it, share it on Facebook, and/or print it for your own personal use.